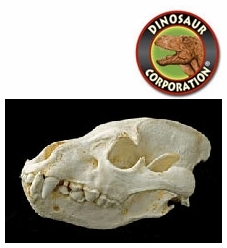 Museum Quality Hyaenidae Skulls: Brown Hyena Skull, HYAENODON Skull, Spotted Hyena Skull, Striped Hyena Skull. Hyenas are thought to have originated 22 million years ago from arboreal ancestors bearing similarities to the modern Banded Palm Civet. Plioviverrops, one of the earliest Hyenas, was a lithe Civet-like creature which inhabited Eurasia 20-22 million years ago.